The Project X EvenFlow line was designed for the mid swing speed range golfer. The Red is the third shaft in the series. The EvenFlow Blue and Black the mid and low launch versions were reviewed in the fall. This video was shot in January at ACCRA day at the PGA Merchandise show. We were outdoors in the wind, the video is not great, but the content is. Bill starts the discussion of the EvenFlow at the 3:30 mark. At the time this video was shot the EvenFlow Red had not been released. Now that it is we can look at the profile and compare it to the EvenFlow Black and EvenFlow Blue. This entry was posted in 2018 Models, Driver Shafts, Russ Ryden - Fit2Score, True Temper on April 30, 2018 by Russ. The KuroKage XD joins the aftermarket family of KuroKage X driver shafts. This started with the KuroKage Proto TiNi several years ago. The KuroKage Proto morphed into the KuroKage XM which was simply updated graphics on a very successful shaft. Now, the KuroKage XT has been updated to the KuroKage XD. The KuroKage XD has a dual wrap of Titanium Nickel prepreg in the tip as you can see in this image. Titanium Mickel (TiNi) is an elastic wire that immediately springs back to its original shape when stretched. 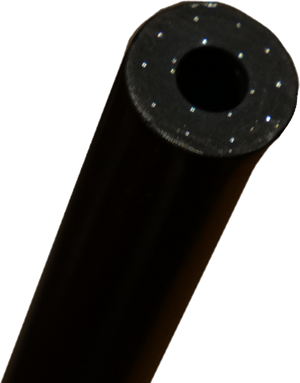 It is used to increase the tip stability of the shaft. If a single wrap is good, as illustrated by multiple PGA Tour wins, Then a double wrap should be better. This is one of an array of that tip reinforcements used by Mitsubishi Chemical. The Tensei Pro White and Tensei Pro Blue have boron reinforced tips. The Tensei Pro Orange has high density MR70 in the tip. This entry was posted in 2018 Models, Driver Shafts, Mitsubishi Chemical, Russ Ryden - Fit2Score on April 24, 2018 by Russ.